The report, released Monday by the New York-based NPD Group, highlights the growing importance of trade-in programs in the fight for brick-and-mortar smartphone sales. Fifty-five percent of those surveyed said that they would use a trade-in program for their next upgrade, while more than 60 percent said that a better trade-in offer would sway their choice of retailers. NPD's report, entitled "Trade In, Trade Up, Trade Out," is based on a survey of 1,000 smartphone users conducted in July. Trade-ins are "the new competitive battlefield" for smartphone sales, according to NPD's Eddie Hold. Major U.S. carriers AT&T, Verizon, and T-Mobile recently launched similar programs aimed at making it easier for consumers to upgrade their devices every year, and Apple is reportedly gearing up to partner with Miami-based Brightstar Corp. to offer an in-store trade in program. 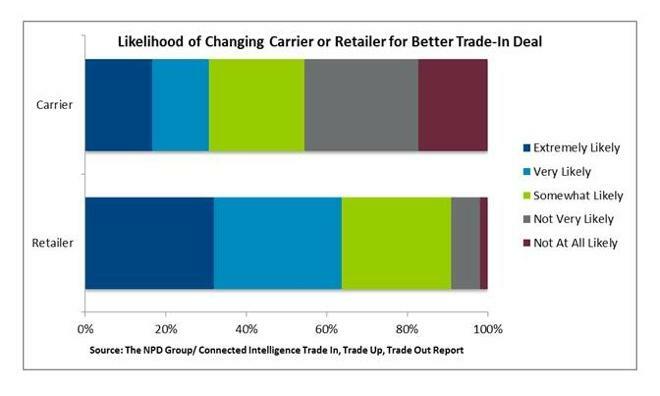 Most customers polled by NPD said trade-in offers would sway their smartphone buying decision. Apple is rumored to be planning to offer its own trade-in program at its retail stores. The program is rumored to give consumers cash in exchange for their old iPhones, bringing new customers in to Apple's stores. In addition, it would allow Apple to profit from the lucrative smartphone resale market, which ships unlocked previous-generation handsets overseas, where customers prefer unsubsidized smartphones. Brightstar also runs trade-in programs for AT&T and T-Mobile. Both carriers value an iPhone 4S trade-in at around $200, though there is no indication of how Apple's offering will compare. This is somewhat lower than third-party trade-in prices, with some companies like Amazon offering up to $300 for a 16GB iPhone 4S ahead of an expected iPhone refresh this fall. Currently, less than 15 percent of iPhones sold in the U.S. are moved via Apple's retail stores, a figure which is said to concern Chief Executive Tim Cook. In response, Apple has begun pushing its retail employees to talk to customers about upgrade opportunities if they bring their iPhone in to a Genius Bar for repairs. The rumored trade-in program could be another piece to Apple's apparent efforts to boost iPhone sales at its own retail stores. Cook was asked about the rumored trade-in program during his company's most recent quarterly earnings conference call, but unsurprisingly declined to confirm whether or not his company plans to launch one. "There are a number of channels that do trade-in programs now not only in the U.S., but in different regions," he said. "And the reason that it's so attractive around the iPhone is the residual value of an iPhone stays so high, and there is so much demand for it, and so that makes the trade-in programs more lucrative to a win-win from many points of view. But we haven't announced anything about us." In addition to reports of the new trade-in program, a new version of the Apple Store iPhone app was recently unveiled that alerts customers when they are eligible for a device upgrade. Wider discretion on price matching in Apple Stores is also reported to be on the way.